Of the four Beatles, Ringo Starr probably gets the most flak. He’s generally seen as a goofy dude who says “peace and love” a bunch and sings one song per record – usually something goofy like “Octopus’ Garden,” too. Thing is, there’s more to him than that. For one, he’s a decent singer and was a bandleader in his own right before joining the Beatles. He’s tremendously influential, both because of the Beatles massive popularity, but also from his techniques and playing; he certainly popularized using a matched grip. 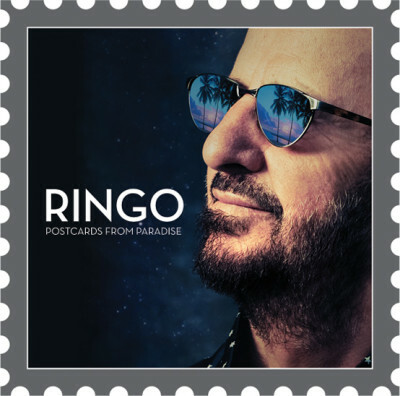 And now, a good 45 years after the Beatles broke up for good, Ringo is releasing his 18th solo album Postcards from Paradise. Over the years he’s kept busy: he’s acted in a handful of films, written a children’s book and toured regularly with his All-Starr bands, where Ringo tours with a bunch of his musician friends and plays a bunch of familiar music. The latest iteration of that band plays on Postcards from Paradise and it’s full of classic rock heavy-hitters: Peter Frampton, Van Dyke Parks, Joe Walsh, and even Todd Rundgren. Their presence makes the music familiar sounding, even if it’s all new material: it’s pop rock that could’ve been released back in 1965, 1985, or 2015. If you’re being nice, you could say it’s timeless; if you’re feeling harsh, you could call it unremarkable. I see it somewhere in the middle: it’s not great, but it’s fun, with it having the feeling of a jam session. Postcards from Paradise with “Rory and the Hurricanes,” a song about the band Ringo was in before the Beatles; over a simple rhythm, Ringo sings about his early days, sounding like a guy with a well-thumbed rhyming dictionary: “we were sleeping on the floor, living on bread and jam / because we thought we’d hit the big time we didn’t give a damn.” Ringo has a drum solo, too. Indeed, there’s lots of nods to his former band throughout the record: “It’s like I said the night before / I’ll love you when I’m 64,” he sings on the title track, for example. The big sound on Postcards from Paradise is Ringo’s drums, which are always right at the front of the mix, and a lot of keyboards. Sometimes they’re trying to give his music a funky sound (“Bamboula”), sometimes just to add musical colour (“Confirmation”). On “Right Side of the Road,” they veer into reggae territory, which actually works a little better than it sounds on paper. What I find most interesting about Postcards from Paradise isn’t just where it shows Ringo Starr at this point in his career, but how it looks when compared to the latest record by the other living Beatle: Paul McCartney. Earlier this year, McCartney showed up on both a Rhianna / Kanye track and the SNL40 special, so of course all the twitter wags cracked jokes about his appearances. But people have been sleeping on McCartney, who has the most interesting post-Beatles career of anyone from that band. And, I dare say, the best one, too. McCartney released his first solo album in 1970 and has steadily worked since, doing everything from an unplugged record to classical to a collection of oldies released specifically for the Soviet marketplace. In late 2013, he released New, his 24th record (not counting side projects and remixes). Most telling is whom he decided to work with: rather than sit back and play comfortably with friends, McCartney is pushing forward, playing new music with young talent: Mark Ronson, Paul Epworth, Ethan Johns. It’s paid real dividends. For most of the record, McCartney bangs out driving pop-rock straight out his Wings era. 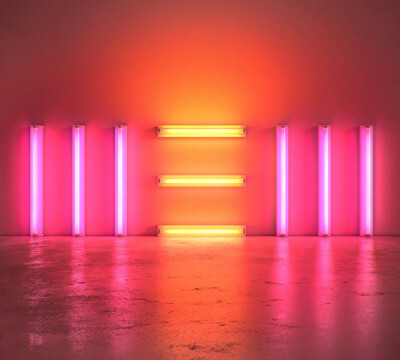 There’s “Save Us” a driving song full of distorted guitars, crashing drums and McCartney shouting, which slides nicely into the slower “Alligator,” where McCartney looks for a muse: “I want someone who can bail me out when I get to my tricks,” he sings. The latter’s one of two songs produced by Ronson, both of which have a slick, electronic feel that dovetails nicely with the material. 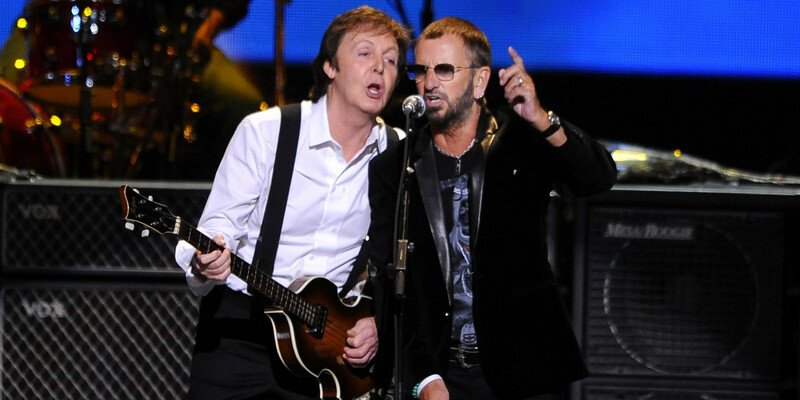 Like Ringo’s Postcards from Paradise, McCartney occasionally looks back to his pre-fame days on New: “On My Way to Work” is about him riding around and thinking about “how far away the future seemed,” while in “Early Days,” McCartney strums an acoustic guitar and croons about his early days as a working musician and how “they couldn’t take it from me if they tried.” But unlike Ringo’s album, McCartney’s album doesn’t just smile and look back, but has an edge and a tension. It never once sounds like people are hanging out, but has as much energy and drive as any of his albums. And musically, his songwriting is as strong as it’s been in a long time: most of New sounds pretty good standing next to his Wings period. And I think that there shows the contrast between these two approaches and their relative success over the years: Ringo comes off like a guy you’d want to hang around with and doesn’t mind touring around, playing his old hits. Meanwhile McCartney’s, New shows someone who’s still driven, even after his 70th birthday, and creating well crafted, driving pop-rock. In other words, it’s why Ringo plays with musicians who peaked in the 70s and McCartney plays with Kanye West. Or why Ringo’s taking a vacation while McCartney continues to work. Follow M. Milner on Twitter.